Dr. Phillips Boulevard and Wallace Road are two highly frequented roads in the Dr. Phillips area. They also surround Dr. Phillips Elementary School. The speed limits on these two roads by Dr. Phillips Elementary are both 45 miles per hour. But not many people actually drive within that speed limit. Hundreds of kids along with many parents cross the two roads at the beginning and end of each school day, and with no established school zone signage by the Elementary school, drivers legally are allowed to go the full 45 MPH. This upset many local parents who believed this to be unsafe for the students. Numerous complaints began to be made to the county as some parents took it upon themselves to raise awareness for drivers to slow down during busy school hours. Parents began to stand outside the school with signs and other indicators to tell drivers to watch their speeds. If there aren’t any active school zone signs legally reducing speed limits, why not do it themselves to keep the students safe. Parents hold signs by Dr. Phillips Elementary urging drivers to slow down. 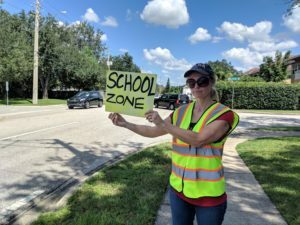 We spoke with Tyrone Young, one of the parents regularly holding school zone signs. Orange County has announced that an established school zone will be set up by the elementary school within the next 3 months. This will include new posted signs, flashing lights, a new crosswalk, and a reduced speed limit during allotted school hours . Speed limits will remain the same until the new speed zone is completed, but until then, parents will continue to take the students safety in to their own hands.